The Titans Radio Network is the radio and television network of the National Football League’s franchise in Nashville, Tennessee, the Tennessee Titans. 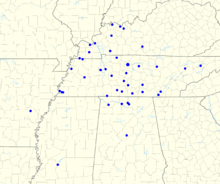 The network consists of almost 70 AM and FM radio stations in Tennessee, along with nearby areas of Kentucky, Alabama, Mississippi, eastern Arkansas, and far southern Illinois. The radio network began with the 1960 American Football League season as the Houston Oiler Radio Network, when the now-Tennessee Titans were based in Houston, Texas, and were known as the Oilers. Houston's KXYZ was the first flagship of the network for 1960 through 1963. KILT was the network’s second flagship station from 1963 to 1975. In the beginning, Majestic Advertising of Milwaukee, Wisconsin was the holder of production rights to the radio broadcasts and pre-season TV broadcasts. In the 1970s and beyond, the network was operated by the Texas State Networks, who also produces their own radio news programs, along with statewide agricultural news updates. KODA took over as the flagship station from 1985 through 1990. KTRH, which was the network flagship from 1976 to 1984, returned to be the flagship for the network for the franchise’s final five seasons in Houston from 1991 until the end of the 1996 season. Around 35 to 40 (and at one point 86) stations broadcast all pre-season and regular season games each season, along with any playoff appearance the Oilers had during its time in Houston. At one point during this time period after the mid 1980s, KQQK served as the flagship for the team's Spanish-language broadcasts in Houston. It was renamed the Tennessee Oilers Radio Network in 1997 during the team’s first season in Tennessee. The headquarters were now located in Nashville, but their home games were played in the Liberty Bowl in Memphis in 1997 and the Vanderbilt University’s Stadium in 1998 and at least until their new stadium, the Adelphia Coliseum (now Nissan Stadium) was completed in August 1999. WGFX became the flagship station for the network, and served as flagship from 1997 until the completion of the 2001 season, although WGFX served as an “affiliate” for the 2004 season. Between the team’s initial relocation and the start of the 1999 preseason, the radio network was spread to many radio stations across Tennessee, as well as southern and western Kentucky, northern and central Alabama, and portions of three other states. Titans Radio signed up over 50 affiliates in non-metro areas and a few major cities. In 1999, the radio network’s name was changed to the Titans Radio Network to reflect the team’s name change. It was first used in the Titans first pre-season game in August 1999. Country-music formatted station WKDF, now one of WGFX’s in-market sister stations, became the new flagship station in 2002. WGFX, which became a sports talk radio station in 2003, returned as the flagship for the Titans Radio Network starting with the 2010 season. The team had long refused distribution of these radio broadcasts to Sirius XM Radio, because the Titans' contract with Citadel Broadcasting (then-parent of both WKDF and WGFX) predated the arrival of satellite radio. However, in 2011, the Titans extend their agreement with existing radio partners while a provision allowing home games to be broadcast on Sirius XM. The Titans became the last NFL franchise to reach such a deal. Gallatin (Nashville) WGFX FM 104.5 Flagship station of the network. Also the secondary Titans Radio station for the Clarksville, Tennessee, Hopkinsville, Kentucky and Bowling Green, Kentucky areas. Providence (Madisonville) WWKY FM 97.7 Also serves the Central City and Greenville area via its own signal. ↑ ”$81.5 million is the painless broadcast price for football ‘76”. Broadcasting, August 9, 1976, pages 24-34. ↑ Oilers hope to prove lame ducks can soar. The New York Times. Retrieved January 13, 2012. ↑ Sirius XM Radio promotional material. Retrieved November 28, 2008. ↑ "Titans Radio Contact Form & FAQ" Titans Radio Network. Retrieved November 27, 2014. ↑ 2008 Tennessee Titans Media Guide, page 548. AaBbCc = Owned by The Walt Disney Company; operated by Cumulus under an LMA. * = Owned by CBS Radio, operated by Cumulus.